Galaktoboureko is a favorite dessert, and these individual servings are made with the same delicious custard filling rolled up into neat packets made with phyllo pastry sheets. Note: Defrost the phyllo dough in the refrigerator the day before. Bring the phyllo to room temperature before beginning, and do not open the package until the filling has been prepared and you’re ready to start making the pastry. When you do open it, keep unused portion covered with a piece of waxed paper or plastic wrap and a cool damp towel. Make sure hands are dry when handling. Make the syrup: Combine sugar and water in a small saucepan. Bring to a boil over medium heat. Add lemon peel and cinnamon, reduce heat to low and cook for 10 minutes. Remove from heat, add lemon juice (do not stir) and set aside. Make the custard: With an electric mixer on high speed, beat 1 egg with 1/3 of the sugar until light and fluffy; add another egg and another 1/3 of the sugar, and repeat until all 3 eggs and all the sugar have been beaten together. Continue to beat on high for 2 minutes. Beat in the semolina, lemon juice, and grated lemon peel. Continue beating and add the milk and 1 tablespoon of the melted butter. Beat for another 5-6 minutes until the mixture is light and fluffy. Transfer the custard to a pot and heat over medium heat. Whisk vigorously until it thickens to the consistency of ketchup (or puréed baby food). Remove from heat immediately and set aside. Tip: If the custard has thickened a little too much, transfer to a bowl, whisk, and continue with the recipe. If left in a hot pot, it could continue to thicken further. Prepare the rollups: Brush the bottom and sides of two or more shallow baking pans with melted butter. Open the phyllo dough and work with 5 sheets at a time, keeping the rest covered. Place the phyllo lengthwise in front of you on a dry work surface. Fold the sheet in half from side to side and brush the top lightly with butter. Using a pastry bag or tablespoon, place custard (about 2 to 2 1/2 tablespoonfuls) across the bottom of the phyllo (shorter side), about 1 inch in from the bottom and sides. Fold the phyllo up over the custard from the bottom, and roll up two or three times, trying to make sure there’s no air space between the dough and the custard. Fold the sides in to create a straight channel and roll the pastry up the rest of the way. 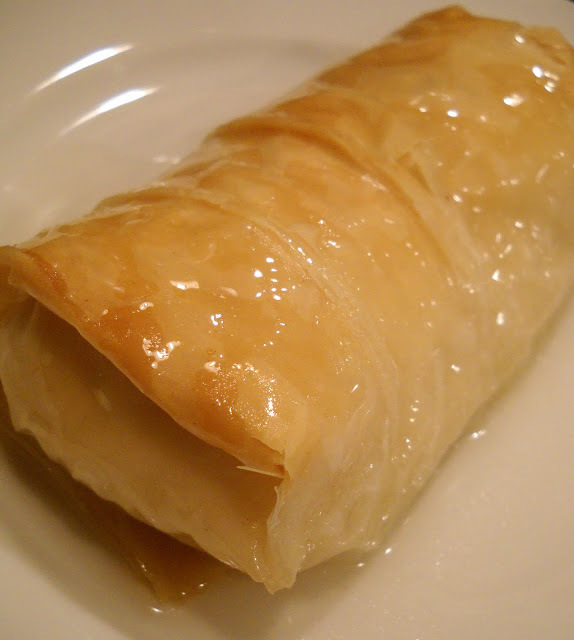 If needed to keep the rolls fairly tight, brush the phyllo with a little more butter to avoid stressing the phyllo, which could result in tearing; however, do not roll too tightly as the custard will expand a bit during cooking. Place the roll in the baking pan with the seam side down and continue until all custard is used. Do not place too closely together. Package any remaining phyllo in airtight wrapping and refrigerate for use another time. Do not freeze. It will keep for about 10 days. Brush the tops and sides of the rolls with melted butter and bake at 350°F (175°C) on the rack just below the middle of the oven for 30 to 35 minutes, until golden. Remove the pan from the oven and pour cooled syrup (remove cinnamon stick and lemon peel first) evenly over the pastries to the edges of the pan. Let sit several hours until syrup is absorbed and the pastries come to room temperature. 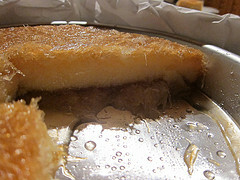 Galaktoboureko should be eaten within a day or two. Store in an airtight container in the refrigerator.